Sudanese Gunners come from all over Africa. Made up of slaves and freemen, these sought after troops are well trained and disciplined troops. 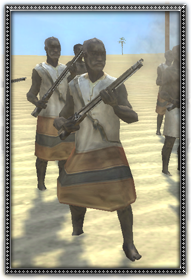 Armed with an arquebus, this forerunner of the musket is capable of firing deadly armour piercing shots. This noisy, smokey and lethal weapon is so intimidating it causes morale damage as well as physical hurt.